When we visited Tucson for the first time in February 2007, we took this photo while driving around in the desert. Last weekend we ended up driving by the same spot, so we took an updated version of the photo. After we recovered from the drive and settled in a bit, I looked up the local CrossFit gyms to find a good box to work out at and get involved with. These guys here at CrossFit Works are awesome! Great trainers, excellent programming, a good mix of super nice people, very cool place. I’ve been working out with them since last week. We’re also talking about how I can get involved and help out. Looking forward to putting my skills to use and expand them. It’s good to be working out again, especially with such a cool crowd. On Saturday, we accepted an offer on our house in Fremont. Our realtor picked the top six offers, countered them, four stayed in the race, and of those we picked the one we felt most comfortable with – $50K over asking price – score! Today, our final counter offer for the house on Palo Verde Vista was accepted – we got it for $19K under asking price (which was already nice at $128/sq ft.) – score! Now let’s hope that everything goes smoothly. After all of the house stuff on Saturday, we spontaneously hit the road on Sunday and ended up in Tombstone about 75 miles away. 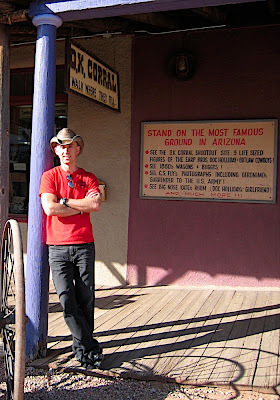 It is famous primarily for the Gunfight at the OK Corral between Wyatt Earp, Doc Holliday and others. The day was sunny and we strolled around town just having fun–and shopping for hats for Alex. Check out what’s replacing his baseball caps and keeping him cool in the AZ sun! Click here for a few more photos of Tombstone. Many thanks to all of you who weighed in on our house choices. It’s a big decision and it was good to hear all of your wise advice and opinions. We made an initial offer on house #1 (Palo Verde Vista Place) on Saturday afternoon. We confirmed that we couldn’t get high-speed Internet at house #2, which Alex needs to work remotely. So we looked at a few more houses on Friday and Saturday, but they didn’t fit either. We had expanded our search parameters considerably–looked at older houses, more expensive houses, houses outside our target areas–but something didn’t work with each. They were too far out to get high-speed Internet access, or were just starting the short sale process and would take 3 months to close. We ultimately decided to make an offer on house #1. It’s big with a great view in a nice neighborhood and the bonus/game room is separated slightly from the main area by being just down the hall. The interior is a bit bland, and the back patio area needs further development, but these are things that we can change. The asking price is good, especially for that neighborhood, and we are getting a lot of house (2006 house from a reputable builder, 3480sf, .93 acres for an asking price just under $134 per sf). We expect to get a counter offer from the seller tomorrow since they typically wait until the last minute to respond in hopes of receiving an additional offer. We’re hoping to be under contract soon on the house, close escrow quickly, and get started settling in. Thanks again for everyone’s help in (hopefully) choosing our new home! After countering the top 7 offers, we accepted a contract on our Fremont house on Saturday afternoon. It was the third highest offer with the highest two being $10 and $11K higher but it was the one that was the best overall package since the buyer is pre-approved, not just pre-qualified, they are using a good broker/bank, and we should be able to close escrow pretty quickly. Many of the others want to be considered back-up offers if this one falls through. Since we have already had all of the inspections done and fixed what was found, the buy agreed to buy the house ‘AS IS’ and make up in cash any difference if the appraisal is not as high as their offer. So we should be able to wrap that up pretty quickly. What a relief! We heard today that we have 34!!! offers on our house in Fremont. Bidding closed today and our agent reviewed all of the offers, looking at the total package of bid amount, ability to close escrow quickly, and financials–either a cash offer or solid pre-approved financing. We know that there are bids way over asking price and he is preparing to counter multiple offers to get us the best overall package. Once we have a contract in place, we can make a strong offer on a place here (if we’re ready). Yeah and yeah Steve Ornellas, our realtor!!!! This should bring up the comps in the neighborhood. We’ve recently seen more houses and had better results. We are excited to have found two possibilities. There are key differences in the houses, but both could potentially work for us. They are basically the same price. We welcome your thoughts or comments as we consider both houses. What do you think? Location: West of I-10, it is 5 minutes from the freeway, and only 5 miles from the main areas we’d shop in. Size: 3480 sf (plenty big), but only .93 acres. It is 4 bedrooms, 2.5 baths plus a large gameroom w/wet bar. Exterior: Sante Fe style but a little boxier than some. Setting: Part of a planned neighborhood but with larger lots, so we’d have neighbors on the street and we see other houses from our patio, but none of their patios face ours, so it would still be fairly private. Views: It has both mountain and city lights views from the patio. Builder: Built by Sombra, a builder of several planned neighborhoods in the Tucson area. Interior Style: Nice but a little generic. One of the larger floor plans with some upgraded finishes. HOA: A $10/month HOA but these have rules. Pros: With 4 bedrooms plus the big game room, we have room for everything we need. House is fairly new and in good condition. Only major work is in the back patio. None of the areas (kitchen, laundry, closets, garage, patio) are ‘best of’ but nothing is bad. A nice example of a contemporary Sante Fe house set in a nice neighborhood. Can see TV from sink/counter area in kitchen when cooking, doing dishes. Cons or Challenges: An older couple lives there and it is packed with their stuff and they aren’t big on maintenance. There is currently no fencing for the big dog that Alex would like to get. Would need to extend the concrete of the upper patio before it would comfortably fit a patio table. Back area would be on two levels. Long address. Internet access? Location: In Northwest Tucson, 10 minutes from I-10. 8.5 miles (20 minutes) from main shopping areas. Size: 3009 sf house w/3 bedrooms, 2.75 baths, two bonus rooms (office/den, storage room). 2.15 acres. Exterior: Santa Fe style with two nice gates and a nice area around the front door. Great natural desert. Setting: Set back off the street, more isolated. Views: Views are wonderful natural desert plants with the mountain ranges in the background. Builder: Custom or semi-custom but we don’t yet know the builder. Feels very well built. Year Built: Built in 1998, but newly remodeled which has brought up the value of the house. Interior Style: More Tucson style with saltillo tiles, wooden beams (vigas), Mexican tile, Southwest touches. Pros: Great setting, great views, privacy, big back yard, huge garage, great laundry room, room for a walk-in pantry, a dedicated storage room, more curb appeal, like all-tile floors (no carpet). 4-car 1650 sf garage that is double deep. We’d use half of it for Crossfit equipment, workshop, etc. 900 sf of the garage is sealed off so that it can be heated/cooled and has a built-in workshop. Great outdoor fireplace area. Feels well built, has lots of special details, and has been well cared for. Oriented with the front facing the East (good). Has a big back yard, a great fence for dogs, storage shed. Cons or Challenges: Common areas don’t flow as well as I’d like and I’m not that excited about the look of the kitchen even though it is newly remodeled. The kitchen feels like it was made for a short person. There are only 3 bedrooms. We want two offices and a dedicated guestroom, so someone would have their office in the windowless den. The kitchen is near the living room, but I wouldn’t be able to watch something while doing dishes. Not a huge fan of the cabinets or countertops but they do have the pull-out drawers inside and the lazy suzans in the corner cabinets. Other comments: Not sure if we can get high-speed Internet access–a must-have. The driveway is dirt but we could cover it with gravel. The gates give it external charm. Some fixtures and ceiling fans need updating; may redo tile in master bath. Would make a few changes in the kitchen. Back patio isn’t very deep now but we have the fireplace area until we finish out the back yard. Would do more rockscaping out front. Has character and personality. Issues: Can we deal with the windowless office, can I make the kitchen more lovable without a big remodel, and is there Internet acces? It has been an intense week of househunting. I looked at houses 6 out of 7 days last week and spent tons of time researching. I’ve composed lots of posts in my head so that I could share this search with my friends, but I’m now finally getting it created! January to March are prime househunting months when snowbirds househunt. A lot of homes are under contract already but the more expensive the house, the more choice there is. Almost every house we’ve seen so far in our desired range has had an issue that makes it less desirable so it sometimes feels like choosing the lesser of the evils–bad layout, too near the road, too small, too far out. Here are MLS links to a few of the houses for those who have been clamoring for photos and links. Feel free to help us in finding a good one! We went to the Motor Vehicle Department to get Arizona driver licenses and titles for our cars. Not only were we done in a little over half an hour after walking in, we walked out with the new driver licenses and titles in hand! We went to Costco one evening to get food. Few cars in the parking lot, only two of the gas pumps were occupied. Inside, the merchandise was neatly arranged, you could eat off the floor, and there were two people ahead of us in line at the checkout. Driving around today, people used their signals to merge, waited their turn, and thanked you if you let them in. What a concept! I’m glad I’m not driving my Schnitzelrocket around here though. The road quality in many parts of town is poor – probably due to the heat and the rain.